Crete, Ill. --- --July 22, 2018 --- - Despite rainy weather over the past two days at HITS Balmoral Park, the sun seemed to favor the Hunter competitors, peeking out each day as the Children's and Adult Amateur Hunter riders took to the ring for the USHJA Zones 5 & 6 Children's and Adult Amateur Hunter Championships, presented by SmartPak. 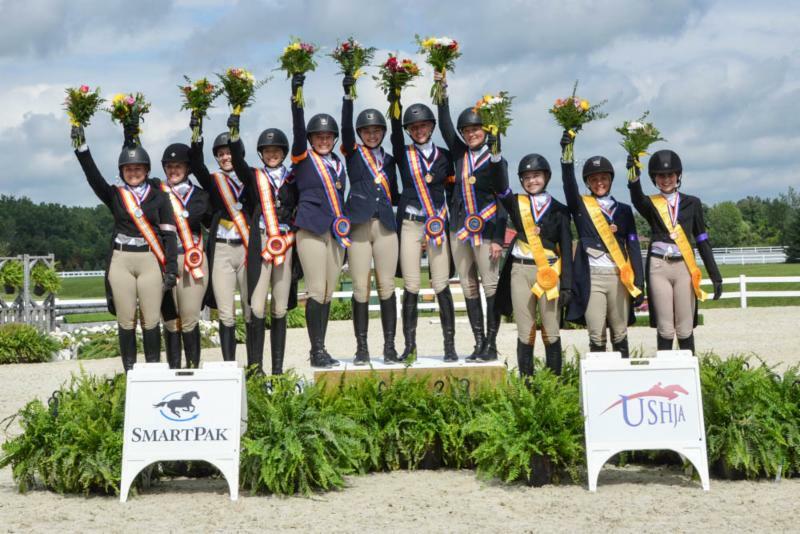 Fourteen riders from USHJA Zones 5 and 6 competed in the two-day Championships, which featured team and individual competition. 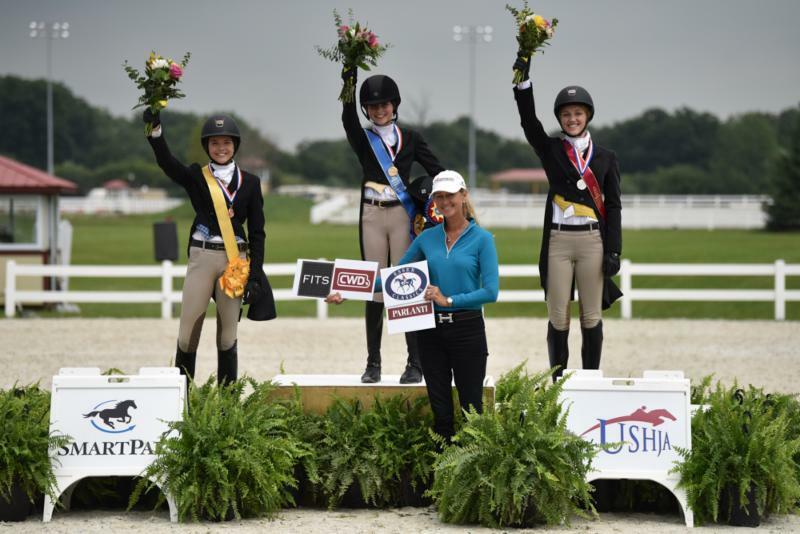 Riders competed as combined Children's and Adult Amateur teams on the first day, and as separate Children's and Adult Amateur sections for the individual competition today. The team day competition brought out great riding but also brought riders together in a way that carried through to Sunday's Individual Championships. Four teams contested the Championships with three of Zone 5 riders and one of Zone 6 riders. The Zone 6 Team of Lydia Soucie, Sharon Golden, Audrey Anderson and Caroline Uffelmann prevailed as gold medalists. "They were all really good!" said Zone 6 Chef d'Equipe Janine Weatherby who was proud of her team's efforts. "The courses were challenging but rideable, and they did a great job. It was a positive experience for everyone. The team aspect is really nice because they can root for everybody else and not just for themselves." Sharon Golden of Plymouth, Minnesota, was on the winning team, and was thrilled with the win, which auspiciously came shortly after her sister Anne Meyer earned a gold team medal in the adjacent Jumper arena as part of the Zones 5 & 6 1.20/1.25m Junior/Amateur Jumper Team Championship. "It couldn't make me any happier," said Golden of earning a gold medal the same day as her sister. "I'm so happy for her and for me to come out and do the same thing on the same day was amazing!" The Zone 5 Pink Team of Ashley Abbruzzi, Olivia Barkell, Madison Winebrenner and Maria Kogen earned siliver, and the Zone 5 Purple Team of Jessica Bertoglio, Emmy Dolin and Emma Gutstein earned bronze! The Zone 5 teams were led by Chef d'Equipe Heide Casciaro. 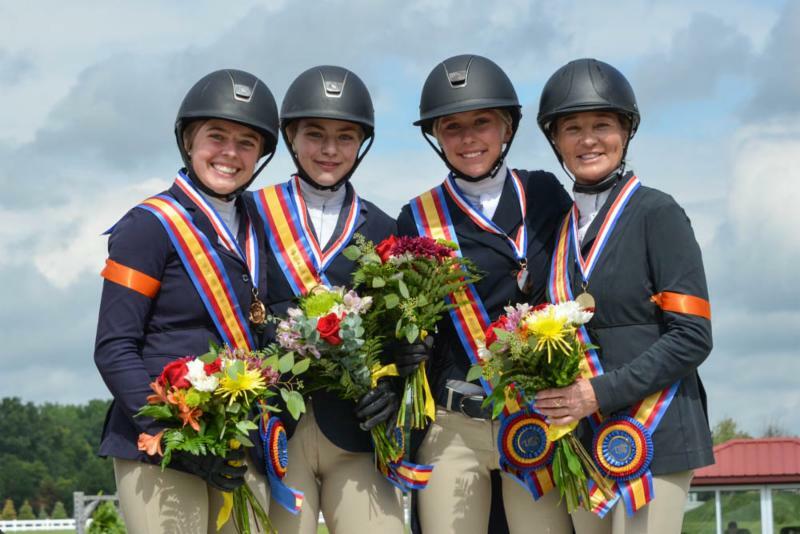 While riders started with a clean slate in the Individual Championships, teammates continued to cheer each other on in their respective sections. The Children's riders began their Individual Championships with the under saddle as the sun emerged after a delayed start in all rings on Sunday afternoon. 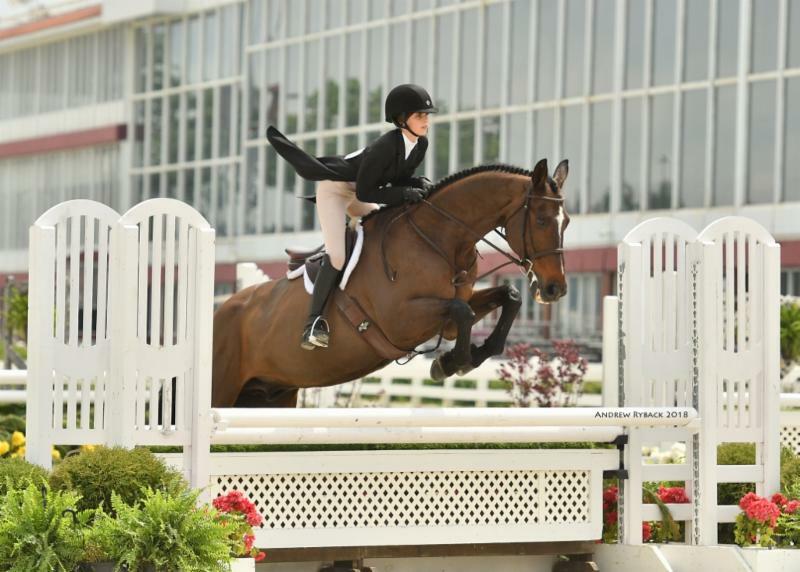 Olivia Barkell,16, of Plymouth, Michigan, rode her own Skyfall to win the under saddle. She went on to put in a beautiful first round, earning third in that class, but the competition heated up in the final round, where she earned fifth. Her scores over the three phases earned her a place on the podium as the bronze medalist. "The Championships went pretty well for me," said Barkell, who trains with Jennifer Blades. "I've only had [Skyfall] for two months, and he's a big sweetheart; he's a cuddle bug, and I'm so thankful to have him." Just four points ahead of Barkell was Madison Winebrenner, 16, of Lexington, Kentucky, riding her own App For That. Winebrenner, who trains with Sarah Meier, put in a lovely final trip that pushed her scores into the silver medal spot. "This is my first time doing the Championships, and I think it went really well," said Winebrenner. I thought it was super fun, and I thought it was really awesome to meet new people." 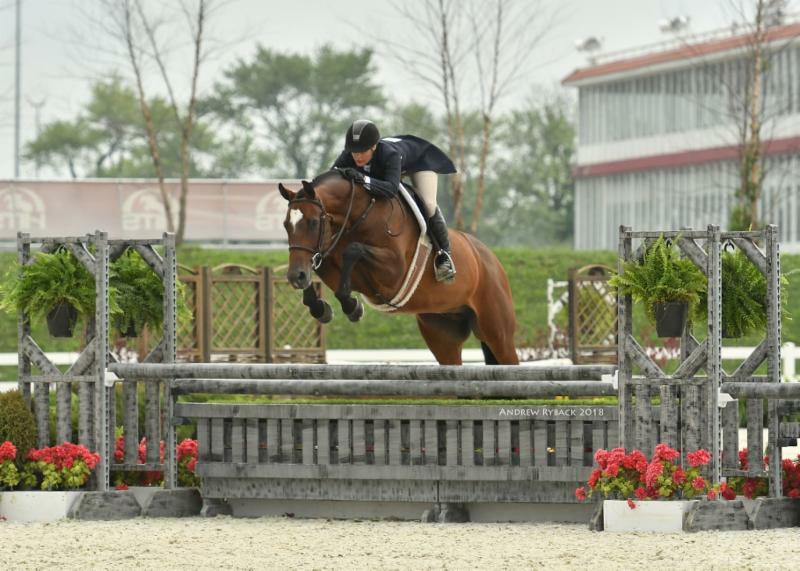 Emma Gutstein of Glencoe, Illinois, rode her own Jupiter to the gold medal spot, earning first in the Handy Hunter round and second in the first round. "To win today just feels amazing," said Gutstein, 12, who rides with Lisa Goldman. "This is one of my biggest accomplishments, and I am so happy that I could do it with Jupiter and everything was perfect. "I thought the Championships were just amazing," she continued. "This was my first time doing them, and I had so much fun. The team competition was so fun, and I just loved it, and today was just the cherry on top." It was a special day because just a short while later as the Adult Amateur Individual Championship finished up, her teammate Jessica Bertoglio from the day before ended up in the gold medal position as well. "It was fantastic from start to finish. I knew based on yesterday if my horse was the same or better, I would do well, and he was fantastic," said Bertoglio who rides with Kimberly Gardiner and is currently leasing the horse she rode to gold, Cullen, from Anne Donovan of West Chicago, Illinois. Bertoglio of South Barrington, Illinois, and Cullen were consistent throughout earning second place in each of the three rounds and an average score of 83 (total 415). "It was really fun. I really liked the team yesterday. I was on a team with a 12 year old and a 15 year old, and they were adorable and really good riders. It was just so great. I had a blast," she continued. "I was cheering them on today, and my teammate [Gutstein] won, so that was really fun to see." Just one point behind Bertoglio in her total score, Maria Kogen of Deerfield, Illinois, and her own True North earned silver with an average of 82.8 (total 414). "Today was awesome. Yesterday was a little windy and my horse was up, so I feel like I redeemed myself today," said Kogen who rides with Kimberly Gardiner as well. "The courses were phenomenal and people were so nice, and he was just fantastic." Lydia Soucie of Lincoln, Nebraska, who was part of the Zone 6 gold medal team on Saturday, earned the bronze medal with her own Zacora CWF. "Today was really exciting because we came back after the team competition, and I have been out all summer with a stress fracture in my leg so this is the first time I've shown this summer," Soucie, who trains with Sybil Greene said. "I qualified and then I got my stress fracture, so I was really pumped to put in some good rounds with my horse today. She was really good." All riders received polo shirts and tote bags from the Championships' presenting sponsor SmartPak. For their efforts, Bertoglio and Gutstein earned gold medals, ribbons, and numerous prizes, including an embroidered cooler, Charles Owen Helmet, CWD halter, Parlanti Boots, Professional's Choice Pro Performance Schooling Boots, Essex Classics Riding Shirt and FITS Riding breeches. The courses were designed by Mike Puffer, and the Championships were adjudicated by two panels of judges Steve Wall and Skip Thornbury (Panel One) and Diane Carney and Jill Worman (Panel Two). 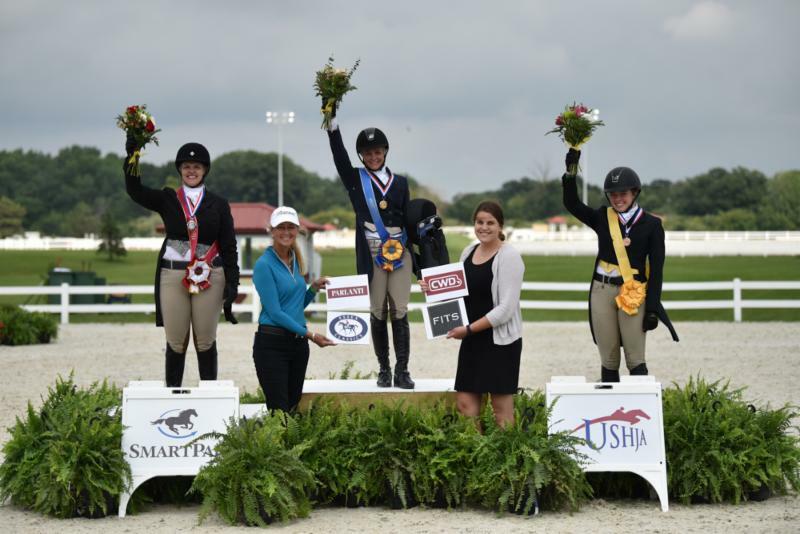 USHJA extends special thanks to Pat Boyle and the entire HITS Chicago team for hosting the USHJA Zones 5 & 6 Children's and Adult Amateur Hunter Championships, presented by SmartPak. USHJA also thanks presenting sponsor SmartPak, as well as awards sponsors Charles Owen, CWD, Parlanti, Professional's Choice, Essex Classics and FITS Riding. USHJA Zone 6 Heide Casciaro said, "I would highly encourage riders to sign up early and get involved. It's really a great experience and as far as the team spirit, it's a lot of fun. The horse show does a great job, and it's a wonderful opportunity for our riders to get some good, different experience." For a complete list of Championship dates and for more information on the USHJA Children's and Adult Amateur Hunter Championships, presented by SmartPak, visit ushja.org/ChAAHunter. Qualifying is still open for Zones 9 and 10. Presenting sponsor of the Championships SmartPak Equine was founded by riders and horse owners for riders and horse owners in 1999 with the purpose of simplifying the administration of nutritional supplements to horses. Their patented SmartPak™ supplement feeding system has been adopted by thousands of barns and horse owners across the country, who value knowing that their supplements will be fed correctly. In addition to the SmartPak supplement system, they offer a broad line of horse health, show apparel, tack, and canine supplies sold online and through their catalogs. More information is available at www.smartpakequine.com.